November 13th through to November 19th, 2015. 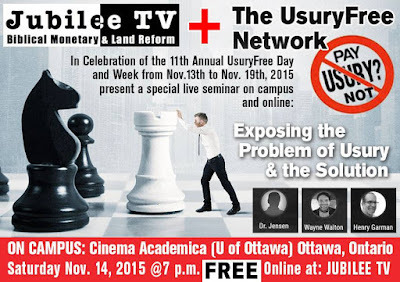 This webinar will expose the problem - the design flaw of usury for the evil and immoral effect that is has upon our orthodox, economic system of debt money and (2) the solution - as offered by the usuryfree community currency movement. To Join the Campus event, go to Cinema Academica (University of Ottawa) in Ottawa, Ontario, Canada - Doors open at 6:30 PM and the event starts at 7:00 PM at the Marion Hall. Auditorium 140 Louis Pasteur, Room 150. Wayne Walton and Henry Garman of Jubilee TV focus on solution-oriented strategies to help enroll 144k to the Kingdom Platform. They will explain how a self-issued, usuryfree time currency can quickly go viral and thereby end war, violence and poverty as well as halting racism and environmental destruction. Dr. John Jensen will present an introduction to the UsuryFree Network and its work. 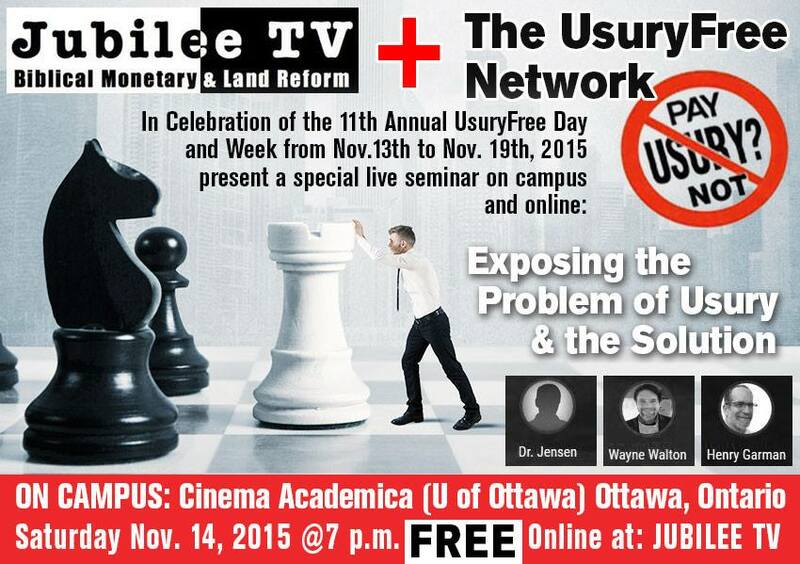 Henry Garman’s presentation is entitled: "Love Revolution Paradigm Shift: Usury Fraud to Jubilee Justice"